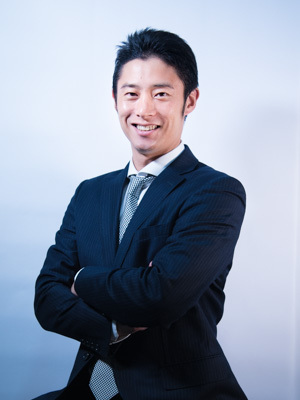 Takehiro Fukuda, a former pitcher for the Yokohama DeNA Baystars, joined the Sports Brain Science Project as a Research Specialist in January 2017. 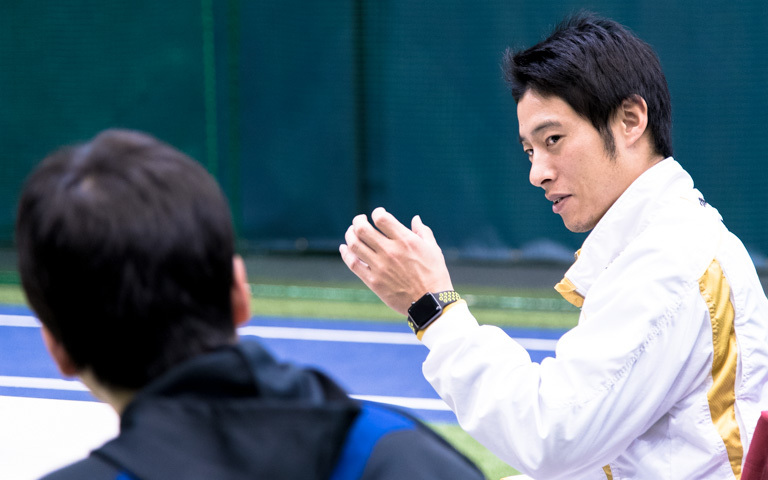 Here Fukuda discusses his aspirations and the role he plays as an interpreter bridging the gap between researcher and athlete based on his own experience and awareness of problems as both researcher and athlete. Can dexterous coordination of the body be learned at anytime? —Dexterous coordination is acquired through a fundamental shift in mindset, but is this something that anyone can do? Fukuda: Yes, I believe that anyone of any age can learn to control their body coordination. I played baseball since my elementary school days, but never exhibited any extraordinary coordination or athletic ability. I was always fairly agile and a fast runner, but my throwing form and accuracy were not that good at first. But then my pitching underwent a remarkable transformation once I became aware of how to control my coordination. —I understand that Dr. Kashino didn't start pitching until he was in his 40s. Kashino: That's right. Up to that point I hardly participated in physical activity at all, and the fact that no one was around to teach me turned out to be a blessing in that is prompted my current research. Who would have thought that I am now getting direct instruction from top athletes like Mr. Kuwata and Fukuda? (laughs). In this venture, I am able to experience both the joy and the toil of being instructed. People have different points of view and use different terms and expressions in teaching. Some advice may be impossible to follow even if you are aware of it, while other advice is completely unexpected yet makes perfect sense once it is pointed out to you. Of course, there are some things that can be immediately improved, yet still take some time to digest. This may be an instance where you can understand something, but the body has to gradually digest it. In any event, I am in the fortunate position of receiving accurate advice from top athletes, so I can technically throw a pretty good pitch if I do say so myself, and I hear that even at this ripe old age there is still lots of room for improvement. 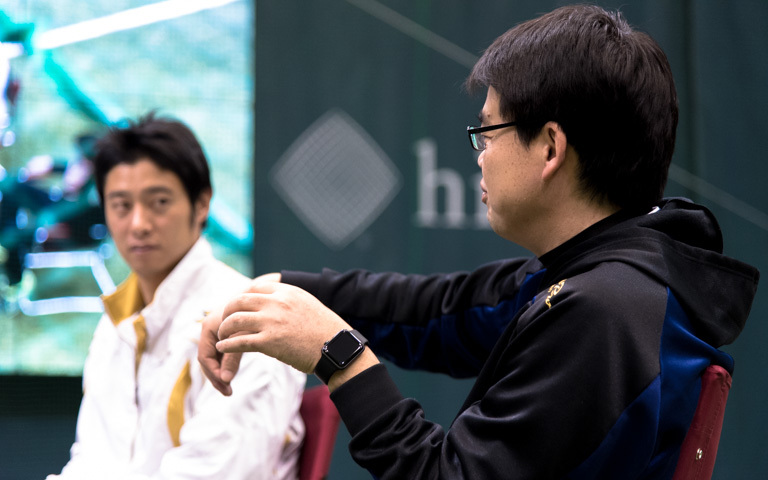 Fukuda: Actually, I think you're throwing better than last year, and it has been very interesting to watch you gradually grasp something and improve. —I understand that you had some medical problems. Was this a problem of control or coordination of the body? Fukuda: You could say that. Among pro pitchers, some are just naturally born with coordination and ability, while others painstakingly cultivate their abilities by learning to relax through long years on a team. In my case, I eventually learned to throw 150-km/h pitches but it took an immense amount of practice and hard work. I can pitch okay if I give it my best, but every throw takes all my effort and I still feel tired the next day. But when I looked around at other pro teammates, I noticed that they focused their energy for short bursts when their performance is really important, and they seemed to have mastered a way of not becoming fatigued. I wish I knew how they do it, but I couldn't figure it out. The professional pitcher capable of constantly throwing 150-km/h pitches clearly has a reserve of energy. And they are able to keep on throwing day after day, year after year. Me, on the other hand, I broke my elbow and knee, and had to go in for surgery. I succeeded in becoming a professional pitcher, but had to conclude that playing in the big leagues is much tougher than I imagined. —So do you think there are big inherent differences in the bodies we're born with?? Fukuda: Yes, I would have to say there are major differences. Taking engine displacement as an analogy, it's the difference between my engine, a 600-cc minicar, and the engine of a pro pitcher in the majors who throws 160 innings per year, a 6,000-cc turbo engine. Yet the body is able to remarkably adapt to different environments that it finds itself in. For those four years that I played on a professional team I made the largest progress . Pretty much everything was taken care of and included—meals, training, coaching—so I could just concentrate on the game. I gained some weight in all the right places. It was tremendously fulfilling, and for those four years I played better than I ever had in the past or likely will in the future. Considering that I retired at 30 and reached the pinnacle of my abilities in my late 20s, I don't think that age makes that much difference in the improvement of one's skills or techniques in sports. It was this insight that made me want to continue my research. There are many late bloomers like me who make their way to baseball, so if I could devise a training method tailored for these slightly older players, I think this would markedly improve their performance. Taking full advantage of my experience and capabilities, this is what I am trying to do now. —Mr. Fukuda has not been with the project for very long, but he is clearly making a difference. Kashino: Fukuda has brought a lot of energy to the project. There has been a surge of interest in the project as more and more people are pledging support and collaborating, indeed it has become a much bigger movement than I would have thought when we first started. Beginning this year, two of Japan's oldest baseball clubs—The University of Tokyo Baseball Club and the Keio University Baseball Club—have started to collaborate. The athletes have shown a willingness to cooperate, and we are now starting to collect data through measurements and experiments in environments that approximate actual ball games. —Did you tense up during actual games? Fukuda: Yes, especially in the first year after I went pro. Even when I was playing on the farm team, I was really uptight. But then in the second half of my first year in August I was bumped up the first team, and after I had pitched about 20 games, I fell into the role and my anxiety subsided. As I got used to being out there on the mound, I settled into the perfect balance of tension as I pitched. What I found interesting was that the pitchers warming up in the bullpen, who are apparently not under the slightest strain, can hardly throw 140-km/h pitches, but then when they take the mound in actual games they start throwing high-velocity 148-km/h pitches. This is why it is so important for the purposes of the project that we conduct our measurements in an atmosphere that closely approximates an actual game. If we can figure out how the brain works under stress, then we should be able to assist second-string pitchers who throw well in the bullpen but fall apart on the mound, or help athletes who can't perform up to their full potential out on the field. Kashino: Until now, if you have a player who can't perform, he was generally just written off as mentally weak and no effort was made to salvage his career. But if we could figure out the internal mechanism that is making the player anxious, we might be able to break the source of excess stress and find a way to relieve the player's tension. My objective is to come up with a scheme that does just that. But first we have to assess the current condition of the player by having him wear a sensor enabling us to determine what is going on internally. As you observed earlier, just getting used to the game at a professional level is a key step. But on the other hand, even those who are quite used to playing pro ball may experience some unexpected incident that causes them to suddenly tense up. I recall a game where the umpire declared a balk. I suddenly tensed up, and threw a string of dead balls. 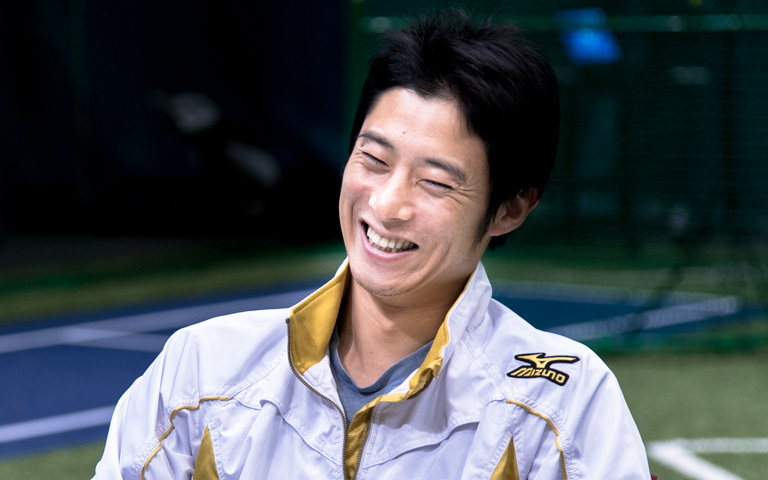 Fukuda: One time in a first-string game I tried a tricky sign play with guys on first and third, but the player on first was a foreigner so I got momentarily distracted and the sign just faded away. Also, I was overwhelmed when Takashi Toritani (a good batter of Hanshin Tigers) was in the batter's box (laugh). You know, those players who we think of as mentally strong may just be more experienced, more used to the game. I am sure you get a nice steady reading every time you measure Kuwata's heart rate, but this could be attributed to things that happened to him during his career—the fact that Kuwata has played in national championships since he was a freshman in high school, that Kuwata wore Giants' ace number 18, and so on— so it's not surprising that he always seems to be relaxed and mellow during games. One reason this project is so compelling is that it's scientifically solving some of these long-standing issues. Pursuing research from the players' perspective on the field based on actual games then providing feedback to the players is highly beneficial. Again, by serving as an interpreter between athletes on the field and researcher, this puts me in an excellent position to fully demonstrate my capabilities. —From the athletes' perspective, what is needed to deliver research results to athletes in the field? Fukuda: One issue that frequently comes up in pro baseball is that new coaches and managers come in, they have their own ways of doing things, and they call for changes. This can create problems for the players. For example, some players may not be able to satisfy the new coach's suggestions or guidelines, or may not be able to fully demonstrate their abilities. Since people have different approaches and ways of expressing themselves, the players are left to assimilate the different messages and figure out how to adapt to the new guidelines. But if players could learn more about the workings and characteristics of their own bodies based on solid biometric information and other objective data, this would be very helpful in suggesting ways they could improve their performance. Kashino: When I talk with topnotch players, I always find that they are extremely thoughtful. Consistent thinking, testing it on yourself, and striving for lofty heights. If the goal is to further brush up your technique, then you have to keep thinking ahead based on your own standards. One of the objectives of the project is to contribute to the support to these kinds of players. At the very least, it should increase the feedback channels. By monitoring and analyzing what is going on internally then feeding information back in various forms, this should help improve the performance of athletes. We should add that the type of feedback information that benefits one player may not be so useful to another player. Some will find great significance in Trackman measurements of spin and trajectory while others will not. If you are not careful, measurement data may throw you off balance in a strange way. So far, there are virtually no systems for extracting the “meaning” of measurement data and feeding it back to players in an appropriate manner. In the sports world of the future, these capabilities will be absolutely critical. 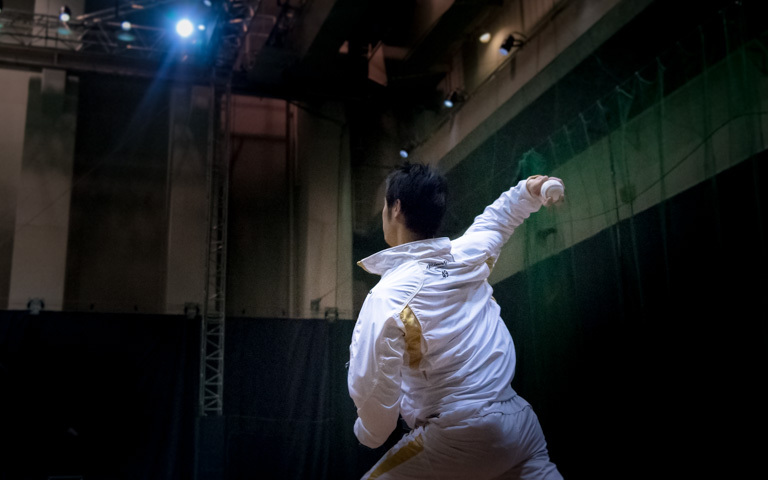 —In Japan's current sports scene, is scientific knowledge not that helpful? Fukuda: Certainly in the areas of muscle training and diet, new finding are quickly incorporated and prove to be very useful, but my impression is that when it comes to body coordination and awareness the baseball world still lags behind. Most pro players are familiar with sports science, but I doubt if many players could tell you much about neuroscience. Kashino: For one thing, there is some misunderstanding of the term science itself. The typical perception is that science means taking measurements using some sort of fancy advanced equipment. But simply taking measurements is not the same as science. Science involves a methodology for taking the results of measurements and using that data to derive valid conclusions: Is the issue properly framed? Have the data been correctly measured? Are there any major gaps in the argument? Does the conclusion have broad generality? Unless these questions are carefully scrutinized, even if simply presenting the results of some item that was measured, it's more than likely that the information will not be remotely useful. If a researcher simply makes up a problem out of whole cloth then solves it, this will not have the slightest beneficial effect in the field. This is why we have taken such pains to dig up real issues from the field. We are trying to create an environment enabling us to better understand one another's feelings. I love baseball even though I'm not that great a player, but I think it would serve a very useful purpose to share awareness of issues among the other players. I realize just how hard it is to improve one's game, and how hard it is to leverage advice and data from coaches. Fukuda: First of all, I would like to get the word out among athletes about this research project, and would encourage more people to get involved. My goal as a researcher is to develop a recipe incorporating mental and physical coordination of the athlete that can be tailored to the needs of different players. And by making this available to baseball players, my hope is that it will lead to enhanced performance.